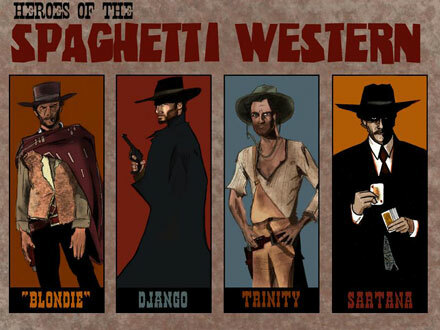 The Italian westerns, known as “Spaghetti Westerns,” didn’t burst onto the American film scene, rather, they slowly seeped into the cinematic landscape of the late 1960’s, filling a void created by an increase in Hollywood’s production of westerns for television. Despite being one of Hollywood’s most formidable and pre-eminent genres, by the 1950’s the industry was producing fewer and fewer western films. With the growing popularity of TV, far more westerns were being produced for the small screen (The Lone Ranger, The Cisco Kid, Fury, Gunsmoke, Maverick, Rawhide, to name only a few) instead of the silver screen. Yet the demand for western films persisted overseas, where television was not catching on as quickly. 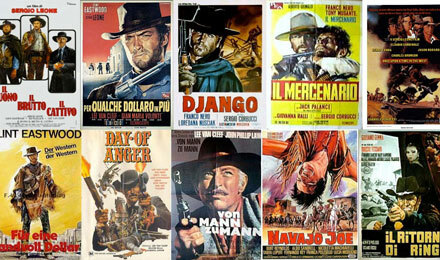 As such, Italian studios (one of the dominant European producers of film in the 50s and 60s) quickly increased their supply of western genre films, the bulk of which were produced by Italian studios. Many of these films were often filmed in Spain, since it had locations that could resemble that of the American southwest and the Mexican/American border. Rome’s Cinecittà studio was regularly producing 200+ films per year and had the production talent that was capable of mimicking the established genres of American cinema. But the production culture of Italian/European cinema still infused the genre films, resulting in a distinctly different type of western, American-influenced but not quite the American westerns that audiences were accustomed to. At this time, Italian cinema was still steeped in Neo-realism, the national cinematic movement characterized by stories of the poor and working-class, filmed on location, often utilizing non-professional actors. But the genre efforts, like the westerns, were a step outside of and beyond the neo-realistic portrayal of the relationship between film culture and the social reality of post-war Italy. Additionally, the Italian westerns were stylistically distinct, featuring the pronounced use of widescreen, heavy influences of Roman Catholic iconography, huge action set-pieces, and a continuing heavy pace of action. But in many ways, the style was also simply an exaggeration of American western tropes, featuring oddball villains, over the top violence, operatic scores, and most importantly, loner protagonists. Central characters defined not by their black and white moral code but, instead, by their moral flexibility, unpredictability, and cynicism. Simply, they were the defining anti-heroes of a genre that previously had been defined by clear cut perceptions of morality, justice, and manifest destiny. When it comes to Spaghetti Westerns, the name most synonymous with the Italian productions is Sergio Leone. The director grew up working in film, learning the trade from neo-realist directors, and working as an assistant director on some of Italy’s most influential films from the 1940’s and 50’s. Leone went on to make twelve of his own features, including the genre-defining dollars trilogy (A Fistful of Dollars, For a Few Dollars More, and The Good, The Bad, and The Ugly), as well as the epic, Once Upon a Time in the West. Perhaps most important is that Leone was the first to score a major hit in Europe and internationally, in the U.S., with A Fistful of Dollars. The film was released in 1964 in Europe, however, didn’t make it to the US until 1967, due to a copyright dispute with the distributors of Akira Kurosawa’s, Yojimbo, which Leone openly stated had inspired Fistful. 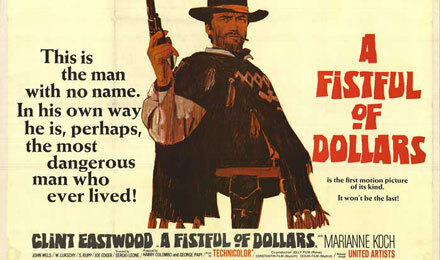 Yet, Fistful has the distinction of being the film which brought the new genre styling to American audiences. And, in the years between the European and American release, Leone had already completed production on the two sequels, allowing for quick, successive releases in the U.S. all in the same year, which established audiences demand for the Italian versions of the American westerns. It was the success of Leone’s westerns that came to define the genre going forward. Despite being Italian productions, which were shot with actors using their native languages, the films were dubbed for international distribution. And, maybe most importantly, these first and most influential Spaghetti Westerns starred Clint Eastwood. While he was hardly on Hollywood’s radar when he agreed to star in A Fistful of Dollars, having only just gotten his role on the TV show Rawhide, the delayed release of the film positioned it so that it came after the show had been airing for seven years. At that point, Eastwood was indeed a western star and the movie was all the more successful as a result. In fact, it was his contract with the television show that didn’t allow for him to do additional film/TV work in the U.S., such that he had to seek out international work in between seasons, leading him to Leone and Italy in the first place. Though Eastwood’s presence surely eased this new western style into the cinemas of late 60’s America, it was still Leone’ style that is most synonymous with the look of the Spaghetti Westerns. One of the most identifiable aspects of Leone’s westerns are the film’s distinct score, a score which was the product of the fruitful partnership between Sergio Leone and composer Ennio Morricone. It was 1964 when Sergio Leone hired Morricone and asked him to help create distinctive score to different version of the western. Because of the Fistful’s limited budget, the composer had to get creative and thus drew on gunshots, whip cracks, whistles, and chants, instead of an orchestral score. The musical effect on the film was that it added humor to the action; it was only one of many ways in which the Leone films broke from classical Hollywood filmmaking. Also different from Hollywood productions, much of Morricone’s score was written before the film was shot, which allowed Leone to use it on set during filming, encouraging the director to draw scenes out to fit the music and thus creating a newly inspired visual pacing. Funny aside, Morricone would later add that this was partly why the films were so slow. Nonetheless, the musical style was established, just as the films would establish a new visual style, and fellow composers would quickly begin imitating Ennio Morricone’s style for other European westerns. Much like Morricone’s music called attention to style, Leone’s films replaced the classical Hollywood look with a camera that announced itself, with striking juxtapositions between wide vistas and extreme close-ups, shootouts that amplified the tension by relentlessly cutting between wide shot, medium shot, close-up, and extreme close-up of characters, and a camera that sits unbearably close to character’s reaction shots. Yet, it wasn’t merely the look that had become more modernized, closer in style to European New Wave (what would later influence Hollywood in 1970’s New Hollywood Cinema era), beyond that, it was a distinctly different characterization of the ideals of the American West. It was a different set of characters that populated an altogether altered thematic playground, one that was profoundly different from the defining American westerns. Aside from more violence and over the top action, Spaghetti Westerns were also marked by dark, gallows humor, and a deep cynicism, which spoke to an altogether different view of social codes. While Hollywood had John Wayne and Gary Cooper, fighting on the side of justice, restoring order and civility, the protagonists of the Spaghetti Westerns were morally ambiguous, self-interested, and driven by their own desires, rather than an obligation to societal good. They operated by taking advantage of disorder to secure their own self-interest. Despite a playful use of the genre’s existing iconography, the films were acutely self-conscious of the classical American film tradition, and in ways both subtle and forthright they played off of American/Hollywood-defined Western mythology. As Leone once said, “I can’t see America any other way than with a European’s eyes, obviously; it fascinates and terrifies me at the same time.” And with that in mind, it is easy to understand how Spaghetti Westerns functioned to distill Hollywood’s western mythology. By nature of being recreations of the genre, while also being made outside the cultural and industrial system of Hollywood, the films became about what America means to those who’ve never seen it, consequently, divorcing the American myth from the American reality. Whereas Hollywood westerns utilized desires of pure freedom to prop up their narratives, only to subdue that desire in the end within a sheen of domestic white civilization, justice, and manifest destiny, the Spaghetti Westerns (and Leone) stripped the rhetoric down to its base motives: self-interest and murderous individualism. Over 600 European Westerns were made between 1960 and 1980, and the films came to dominate and represent the genre in the American market beginning in the late 60’s. However, despite an overall positive audience reception, in America, critics viewed the Spaghetti Westerns as part of a problem and they decried the films’ revisionist approach to a well-established genre. It was only after time that new critical understandings of Leone and other Italian directors would vindicate the massive influence the Spaghetti Westerns had on the genre and the larger cinematic landscape. But, innovative as they were, they eventually would succumb to themselves as the new stylistic influences grew tiring and the genre moved into a period of parody (with other European, and even American directors seeking to emulate the style), which undermined the successful cinematic advances made in the early year. Like in Hollywood, even though it was a critical advancement in filmmaking, it eventually became a fad and ran its course. Regardless, the films of Sergio Leone, and many more of the Spaghetti Westerns (like those from directors Sergio Sollima and Sergi Corbucci, and the sub-genre of Zapata westerns) stand the test of time. Their influence upon cinema is inarguable and the style can be traced to many contemporary films. And for many viewers, the style of the Spaghetti Westerns is the defining iconography of the genre, rather than the tried and true American westerns of Wayne, Cooper, John Ford, Howard Hawks.